Aired: Dec 29, 2008 to ? Welcome to the fascinating world of Gensokyo, in which youkai (A term for all sorts of spiritual creatures), animals and some humans live, completely separated from our world by a magical barrier. The only gateway between the two worlds is the Hakurei shrine. Reimu Hakurei is the maiden working at said shrine. Whenever problems of supernatural causes (known as "Incidents") occur, Reimu goes out with her friends to investigate, eliminate the cause and hopefully restore Gensokyo to its equilibrium. Touhou: Musou Kakyou ( 東方二次創作同人アニメ:夢想夏郷) is an unofficial doujin anime created by MAIKAGE and directed by Tokine. In my personal opinion, I find this doujin absolutely stunning, what made me say this is MAIKAGE's ability to craft the fictional world of Gensokyo and present the characters in the world of Touhou in an accurate and amusing way. Every single character is instantly likable and charismatic in their own way, when this all blends together, it creates a truly amazing anime. Despite the fact that this is an unofficial doujin, it contains everything required for it to be aired on TV, it's even got an opening and closing! For this OVA, MAIKAGE hired official Voice actors, some of them you may be familiar with. (such as Tanaka Rie, voice actor for Maria in Hayate no Gotoku, and Nakahara Mai, voice actor for Rena in Higurashi no Naku koro ni and Sawashiro Miyuki, Voice actor for Celty in Durarara!!) The artwork are much better then to be expected, if not on par with some of the animes on the mainstream. The background music used for Musou Kakyou also helps absorb the viewer into the mystical world of Gensokyo. As mentioned earlier, the characters and how they are presented is really what gave this anime it's high scores. namely Reimu and Remilia. (I squeeled when Reimu appeared for the first time) MAIKAGE did an excellent job of showing Reimu's character, she may look like she's very easy-going and lazy, but deep down, she's a caring girl and friendly. Her strong sense of responsibility is the main reason everyone's attracted to her. That being said, she can be instantly angered when something, or someone she holds dear is under trouble, she wouldn't hold back until said thing is back is made safe again. Remilia on the other side can clearly seen as playful and manipulative and always up to something. Remilia can be rather deceitful and tricky too. These characteristics for Reimu and Remilia is strengthened alot more in Musou Kakyou by their dynamic expressions and talented Voice actors. The reason Touhou:Musou Kakyou inspired me to write a review about it was its talented and marvelous voice actors. Every single voice actor in this OVA makes their character appear more lively and friendly (or in some cases fearful) It just makes you want to hug every single girl!~ An exceptionally well done job to the voice actors of Aya and Sakuya. The voice actor of Aya (Fujimura Ayumi) made Aya's character appear energetic and loud, always bouncing around and shouting at people. The typical Genki-Girl you'll find. Sakuya's voice actor (Tanaka Rie) also did an amazing job for Sakuya's role, the way her voice makes Sakuya sound gentle and elegant, yet capable of being serious at the same time. There are alot more notable mentions, but for now just those two. The art for this doujin was actually suprisingly good. Although at times it looked abit out of proportion, I think it was good, considering that it's an unofficial work. MAIKAGE did a great job of expressing the emotions of the characters, when they are enraged, suprised, befuddled....etc. MAIKAGE made very good use of the lighting and color range for this episode, It made an overall pleasant and shiny effect. In terms of the battle scenes it wasn't overly done of too flashy, it was quick and direct, with fitting BGMs and cool magic effects that wouldn't be considered as lame and childish. comparable to that of Mahou Shoujo Madoka Magica. The concept of spell cards are also very interesting and references back to the original game series. The way MAIKAGE creates the various atmospheres in the world of Gensokyo is also spectacular, be it the mysterious Scarlet Devil Mansion or the inviting and friendly Hakurei Shrine. These atmospheres are further strengthened by background sounds such as Cicadas, Bird chirps and bell gongs. As mentioned earlier, the lighting is unbelievable well done, and shows when things are easy going or when trouble is on it's way. If you have ever played any game in the Touhou series, you would probably agree with me that they would make an awesome anime. MAIKAZE interprets the series very well. The story is based off of Touhou 7.5; Immaterial and Missing Power. You only need a general introduction to the characters. MAIKAZE a great job with this doujin. They utilized IaMP's plot in a great way, and I hope this anime ends well also! The art was nothing special, if anything less than what is expected from a good anime, but since this anime is a doujin, I gave the art a 7 instead of 6. The bad openings for both of the episodes (so far). The characters were amazingly interpreted (does that even make sense?? >. Four years per episode, have to say if Maikaze does 24 episode, I would be dead before I could finish it. Anyway musou kakyou is one of the fan made anime for the touhou series, and since it suppose you know the setting it won't bother to explain it leaving first time viewer confused. In that cause I recommend watching the other three animation attempts or read the wiki. But in case you are too lazy, let me give a quicker version, Reimu (the armpit miko) is the incident solver and everyone else were once involved in an incident. What is a incident? Anything ranging from mass robbery to releasing soul sucking genocide tree to turning the earth in to a nuclear wasteland to causing mass depression. Reimu goes around beating up the people behind it (and anyone who had the misfortune to accidentally cross her path during the process). Back to Maikaze, as one of the four attempts at turning Touhou into an anime (the others being Fantasy kaidoscope, hifuu club activity and the memories of the stars), Maikaze sure takes their time to provide moe touhou. A summer's day dream is the interpretation of moe touhou, but like all touhou stories there is a plot that goes deeper than expected. What appears first as random robbery might have a deeper plot than expected (At least until Reimu beat up everyone for standing between her and her donation box). Intriguing if it weren't for the four year between every episode. For art, first episode is deen level, second episode is watchable, the characters are fully voiced and the animation is okay. Fine doujin work for anyone interested in the touhou series. This review considers the first 3 episodes only. Since this was made around 2008, series canon is taken up until 2007. Most of the story is wasted potential. 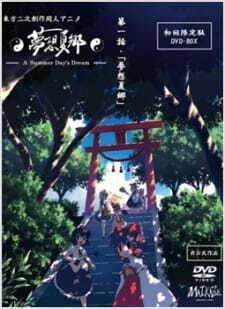 Instead of utilizing the rich and deep backstory the series is known for, the creators chose to instead make a cute slice of life story centered around the lives of the Gensokyonites. Nothing particularly wrong with that, but one can't help but feel that they played it too safe in that regard. Characterizations also felt rushed in that regard. Most of the character hinge on the viewer already being familiar with the Touhou Project series prior to watching the series. Going more in depth to the plot, perhaps it wasn't wise of the developers to make episodes hinging on cliffhangers. Still, the animation and art direction are excellent. If this could be added, why can't Memories of Phantasm/Gensou Mangekyou? Cute, appealing, and oh so fluffy: anime bunny girls are simply irresistible. From the demure to the delicious, you just can’t go wrong with bunny eared anime girls. Forget the neko, let’s see some usagi!